As you know at the start of the Month, MAY…. 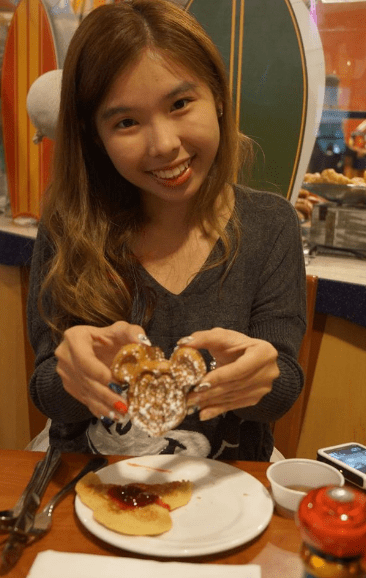 I started off with the Disney Dimsum Blogpost in Hong Kong Disneyland Resort…. 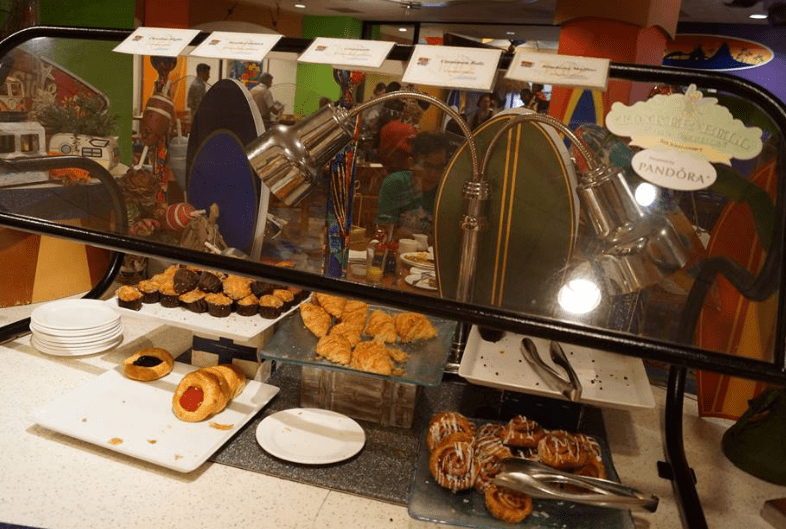 So I decided to recap WHAT I ATE in Disneyland Resort Anaheim, California…. LAST YEAR!!! LOLS!! 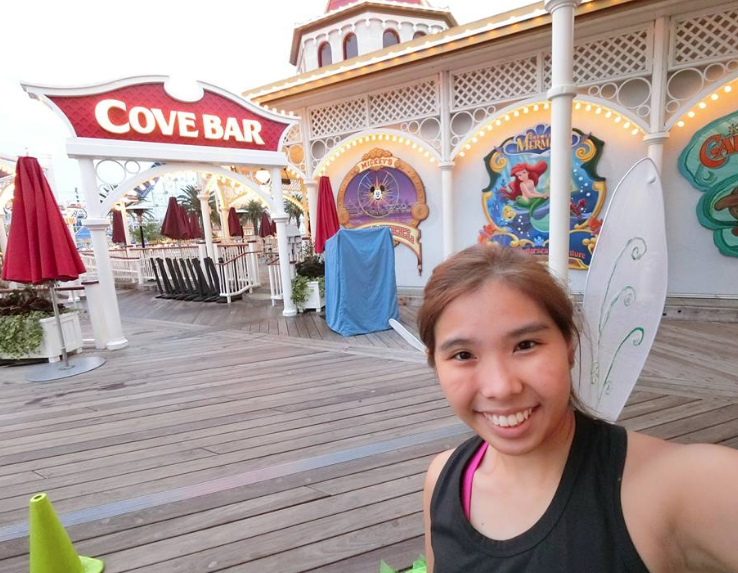 It’s exactly a year ago, I am at California doing the Tinkerbell Half Marathon 2016. It’s the best runDisney experience I ever had. I shared plenty over there so you may read my story and adventure in the Blogpost. 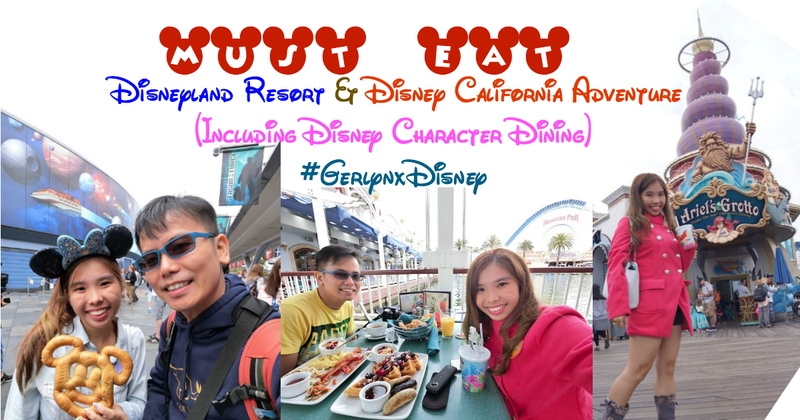 So, I am gonna share first of all, the food you have to buy in Disneyland Resort or Disney California Adventure, I know my list is not comprehensive but I only share what I ate and I will not be sharing whatever you can eat there! I know things like Dole Whip is a must but the queue is terribly long so we decided to give it a miss but Blessing in Disguise, I had my Dole Whip in Six Flags Magic Mountain! It’s crazy right? Then I regret not having Dole Whip at Disneyland Resort so that I could have more DOLE WHIP! 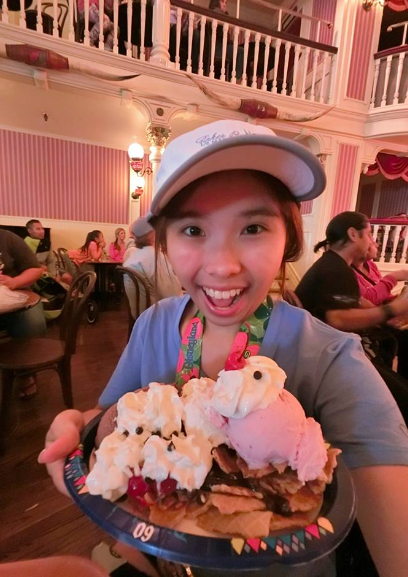 It’s pretty sad that Dole Whip is not available in Hong Kong Disneyland… They should really bring it to Hong Kong! So the first food which I ate is…. 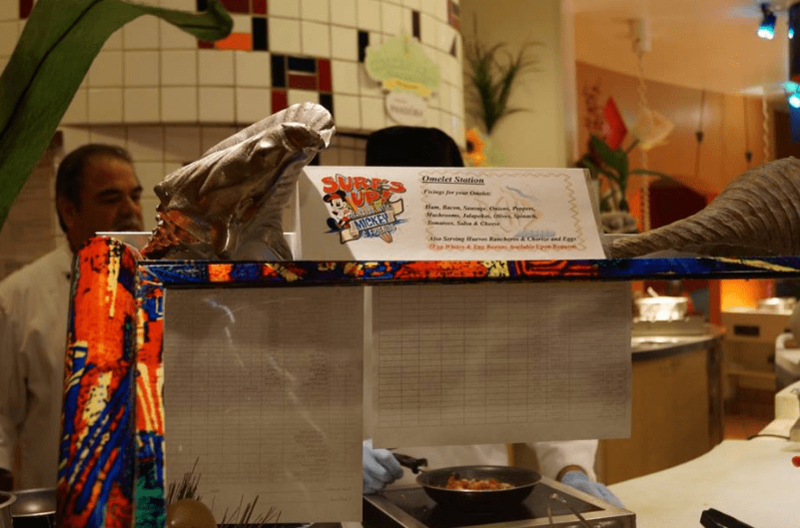 Well, Waffle is quite common in sight if you are doing Buffet Character Dining. So usually I get my dosage of Waffle there instead. But I believe you can get them too in Cafes / Bakery in the park. They tasted like Waffle just any ordinary Waffle but made using the Mickey-Shaped Waffle maker hence you are eating Disney Magic!!! LOLS! 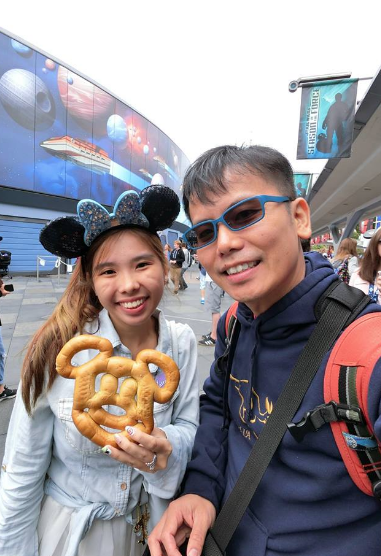 We got our Pretzel from a Push-cart in Tomorrowland. It’s so huge and both of us were so full by just having Pretzel for lunch. Maybe I am a small eater. But I will say Pretzel is amazing. Value for money and definitely not seen in Hong Kong Disneyland unlike Churros. Although I am a great fan of Churros but till the day Disney have “Mickey” Churros, I don’t think I am gonna pay for a Churros there. So what exactly is a Secret Menu Item? It means it’s not in the menu but it can be ordered and made by the Chef! So my friends from my Tinkerbell group told me to order this during my visit. But hor, after posting it here… I doubt it’s a secret anymore… But Good Thing Must Share what!!! How can I not share this amazing food with you? Nachos + Ice cream = Definitely the best food combination in the WORLD! This big bowl of bread bowl is just a big big bowl of awesome goodness. I am sure I gain weight even though I had a meal a day! It’s nothing but delicious, but the biscuit is a little tough for me. So Boon Hee took over it. I ate all of the Mac & Cheese and 50% of the bowl and you should know the rest should be cleared by Mr Casper! LOLOLS! A doting husband should always not waste food wasted by his wife. HAHAHAHAHA!!! I definitely knew of more stuff to eat but you know me and Boon Hee is not a very big eater and we eat only a meal a day because we are really not hungry and the portion for food is so big that we can share them hence we can’t finish our “TO-EAT” list. Picture Taken during Neverland 5k Run when the parks are closed. 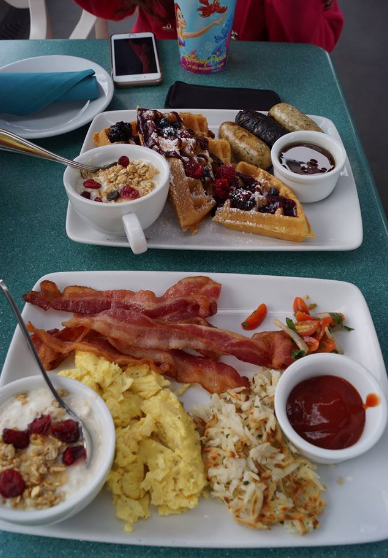 This is the main reason why I need to go back Disney California Adventure! 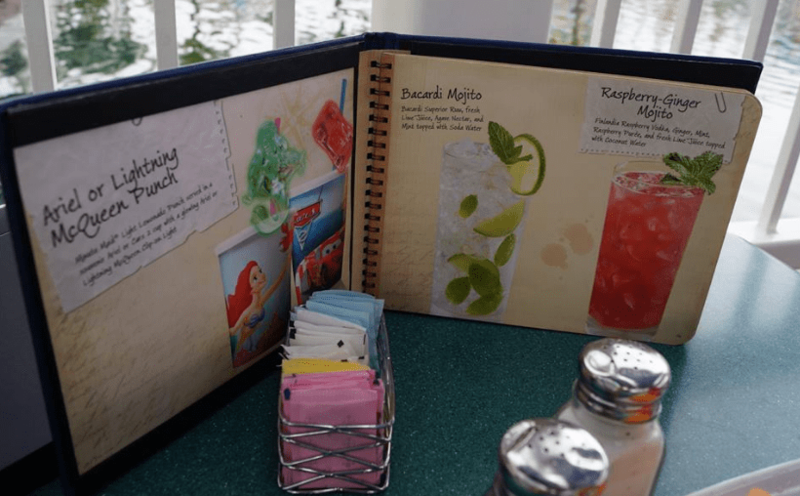 I would go back and order the Neverland Tea (Alcoholic) and Mickey Fun Wheel Drink (Alcoholic)! We avoided Cove Bar for 2 reason during our trip, because we are not people who can drink that well and Jet-Lag make us feel pretty unwell so we decided to skip this. And next main reason….. The queue for Cove Bar is terribly long! Hence reservations is highly recommended. So the next time I am coming back, I am so gonna reserve a place for us. I did 2 Character Dining during my 4 days visit. 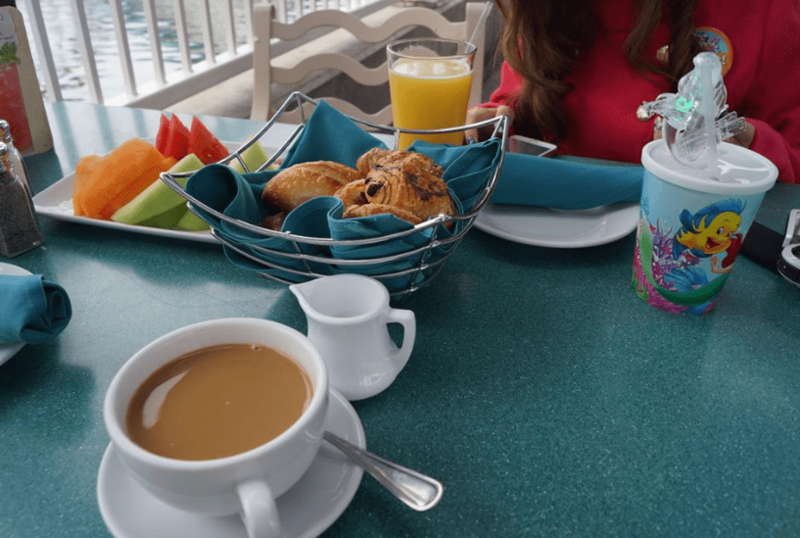 To be honest, Character Dining is pretty expensive but that is the best way to save time. You saved time from queueing for CHARACTERS! Next reason is that Character you meet in the Restaurant spend more time with you, you get a more up-close and personal experience with them. 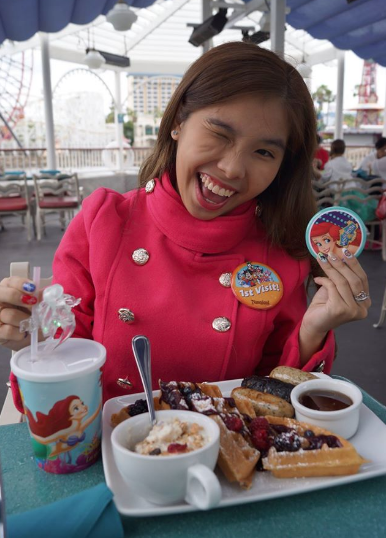 During Hong Kong Disneyland and Disneyland Paris, I did 1 Character dining too in a 2-days trip. I really saved a lot of time during Character Dining, during the Tinkerbell Half Marathon, the queue can go up to 80 mins / Character but within 60 mins (1 hour) dining time, I meet usually up to 5 Characters. I get to eat, get to drink, get to chill, get to meet my Disney Characters. WHAT A GOOD DEAL FOR ME?! He also don’t have to run around under the hot sun to hunt Characters with me and queue for hours and do nothing…. Maybe we play Facebook and upload some photos on Instagram while queueing but I can use this queueing time to play some rides instead!!! 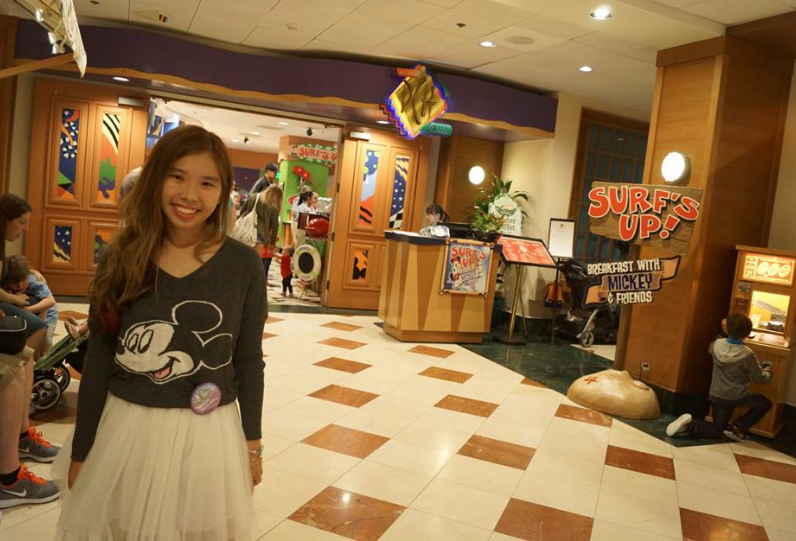 It’s the only place in California which you get to meet Princesses while you are dining. It’s located at Disney California Adventure Park, Paradise Pier. Hence Park Tickets are required. I ordered Fresh Berry Belgian Waffle. ERM… OK… He makes sense again!!! Urgh! Sorry Lightning McQueen. I will come back for you next time!!! 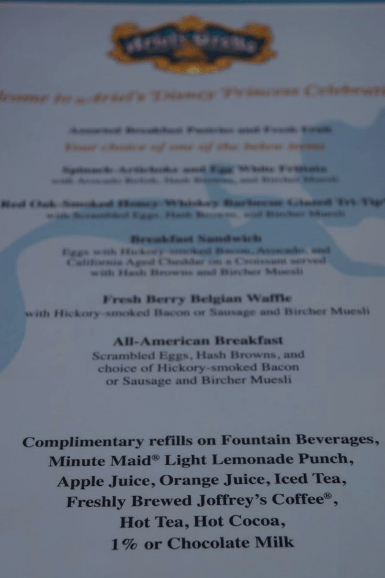 Just For Your Info, all meal in America, you are serve with lots of Bread and Croissant before your mains arrive!!!! 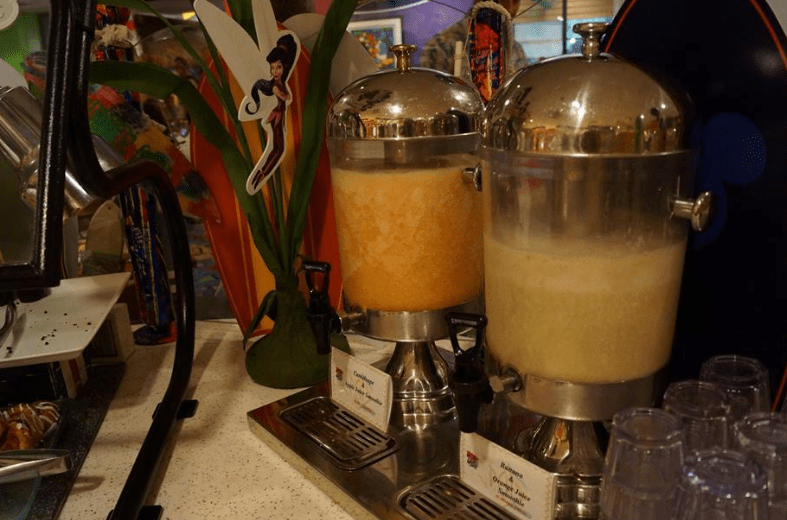 Ariel’s Grotto even serves FRUITS! Hence we are so full by eating the breads and when our Mains came, we can’t finish it. For drinks-wise, my Minute Maid Orange is a free flow and so is Casper’s Coffee. As you all know, I am someone who feel full by just drinking lot’s of water hence I can’t finish my Ariel’s Punch. I was given the Ariel’s Badge!!! OMG!!! So happy about that!!! Actually I think for looks-wise, my meal looks nicer. But I think for taste-wise, Casper’s choice was slightly better. My Waffle is a little tough for me. 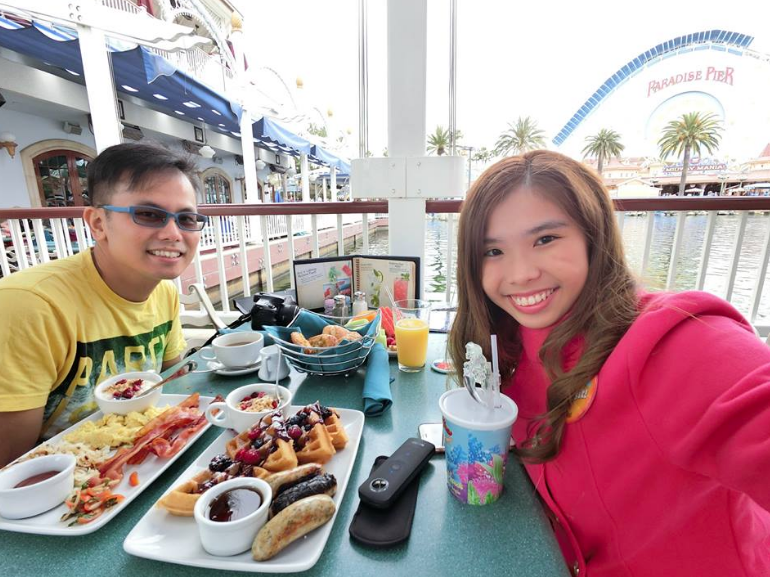 Awesome view which allows us to oversee the whole of Paradise Pier…. Actually I prefer DCA (Disney California Adventure park) more than Disneyland Resort at the end of my journey, I spent more time there because DCA rides are more exciting, they have lesser people during my visit and the pace is just different. In DLR I feel there is lots of unknown stress. I will share more in the next Blogpost which is about the “RIDES Ranking for DCA & DLR”. 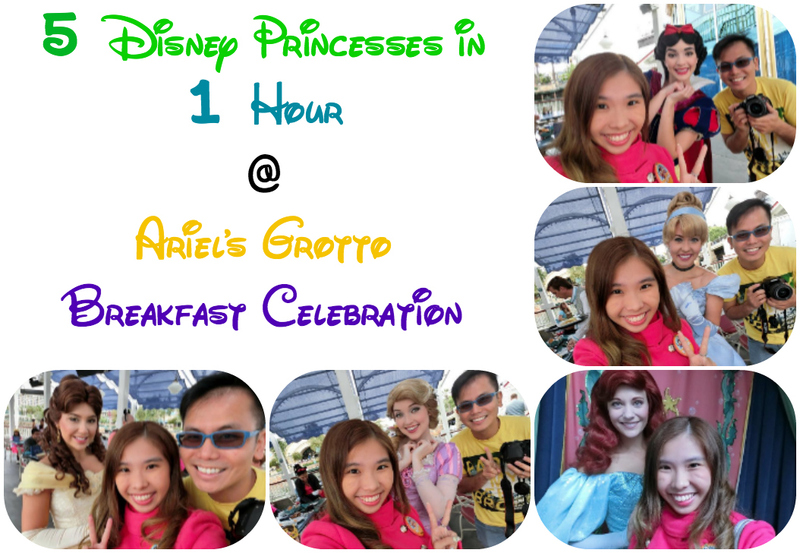 Usually people will queue for at least 30mins each for every Princesses. 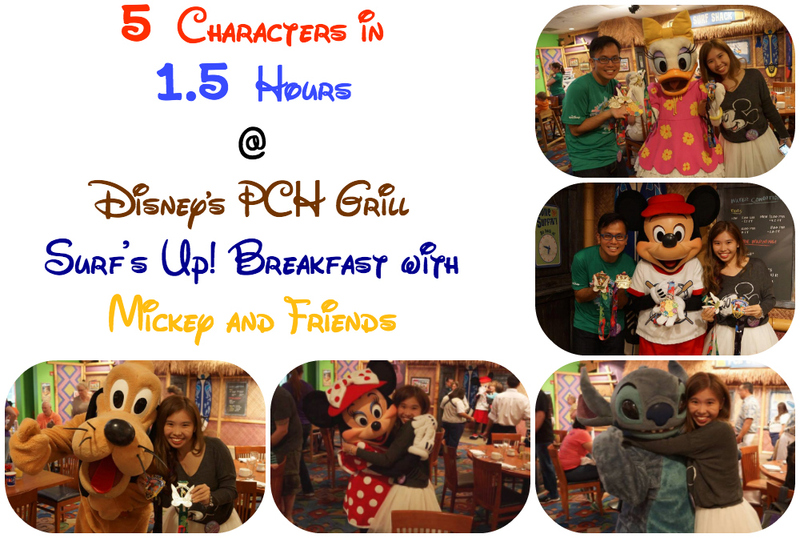 So it’s 2.5 hours but I shorten the time spent by 50% by having Character dining! I saved time…. This was my treat because Casper only promised one Character Dining hence I paid for the extra one. 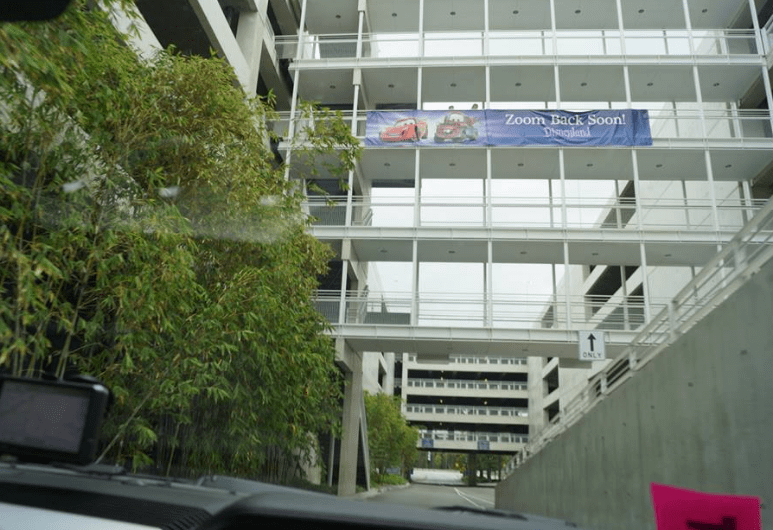 So trust me, Anaheim is a relatively affordable choice if you compare! 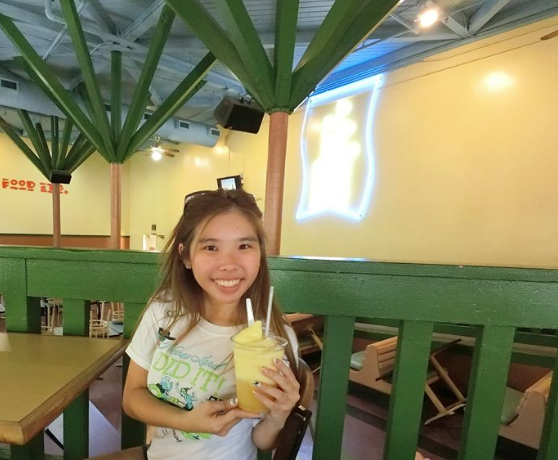 Check out my Live Video during the meal! After this video, I proceed to the Expo to collect my Race Pack and Matthew who saw Casper and I actually commented on our “BIG Breakfast” and I told him, it’s in our bags right now!!! If I can do it again, I will just order one main to share so we don’t waste food. 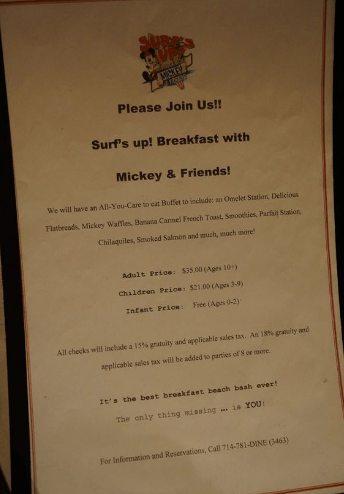 We arrived at the Paradise Pier Hotel for our Breakfast timing! These are the prices, Adult $35 USD. Age 10 and above is considered adult in US. Then we need to include a 15% gratuity aka service charge and also 7.5% of sales tax. 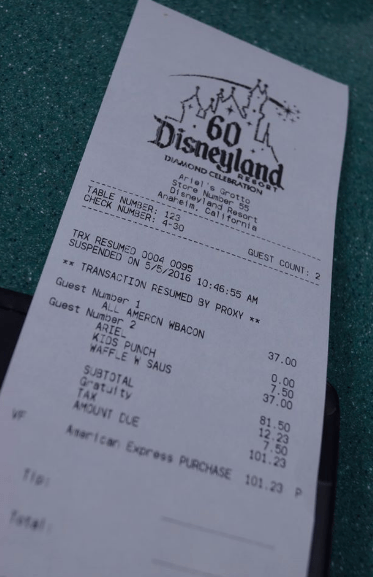 In other places of California, you give tips based on your preference but in Disneyland it’s a compulsory percentage you have to give but I have seen Americans giving tips to their waiter even they have given for gratuity. I will say they are generous, this is not a very common culture in Singapore because all restaurant charges us service charge and we are not brought up to give tips. So Casper and I felt kinda awkward giving tips during this trip. But after this trip, we learn that giving tips is showing appreciation to the service crew that spend so much effort to make our day. During our Batam trip and Paris trip, we made it an effort to remember to have spare change for tips to thank service crew. We are not very well-to-do but we just wanna give whatever we can to these hardworking crews. In Singapore context, giving tips are common seen like “showing-off” that you are well-to-do. But after 2wks of #GerzAdventureInAhMeiLiKa, it really broaden my horizon and learn a new culture. Juices! The more Orangey one is Apple Juice and the more Yellowish one is Orange Juice. Weird? IKR (I Know Right)!!!!! I drink milk instead but I am not sure if the name tags are they placed wrongly because it’s so funny! Bread and Pastry, and 1 Serving of Mr Casper at the back. Did you spot him? I did not know he was in this photo until today!!!! Casper’s favourite station he love eggs… The eggs taste differently, it’s more Milky in my opinion but equally nice but I will stick with my dosage of Sunny side-up! Re-watching this in 2017 and I still laugh out loud and feeling so warmth and feel like crying because Stitch did this for me to make my trip so magical. It’s impossible to recreate this moment anymore. This is why I love Disney Magic so much and visiting Disneyland and hunting for Characters. But Stitch returned all my medals back to me. He even medal hanged them for me! He is really the best Character…. Who love Stitch????? I bet I am not alone. 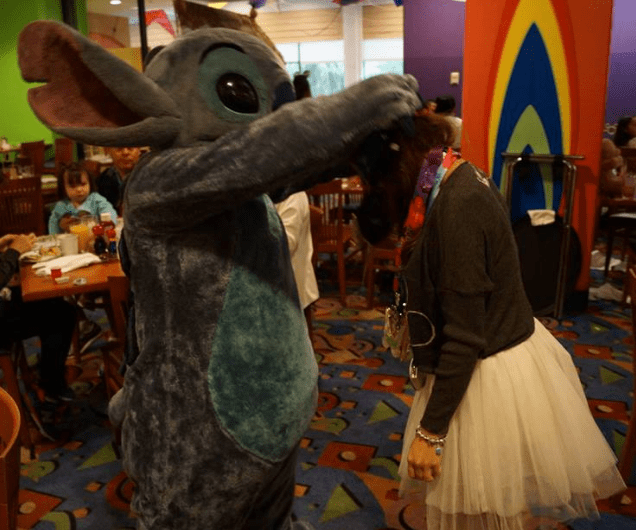 Actually we were told to leave the restaurant after 1 hour but I told their manager, I have not met Stitch yet and I cannot leave. So they gave me an additional 30 mins because Stitch was still dancing with the kids. I am really lucky… But we were rushing for time to collect our rental car and we have not packed our luggage for check-out yet… But 30 mins wait for Stitch is worth-it! I remembered in 2014 when I was in Hong Kong Disneyland, I did not managed to meet Stitch because he was on Sick Leave. So this is my first time meeting Stitch! In 2017 Hong Kong Disneyland I did not managed to meet Cinderella because she is on Sick Leave. I am really thankful that EVA Air flew us to Disneyland on their 60th Birthday. I am really so blessed and lucky! I will definitely ZOOM BACK SOON! I have too many regrets… I must RETURN! 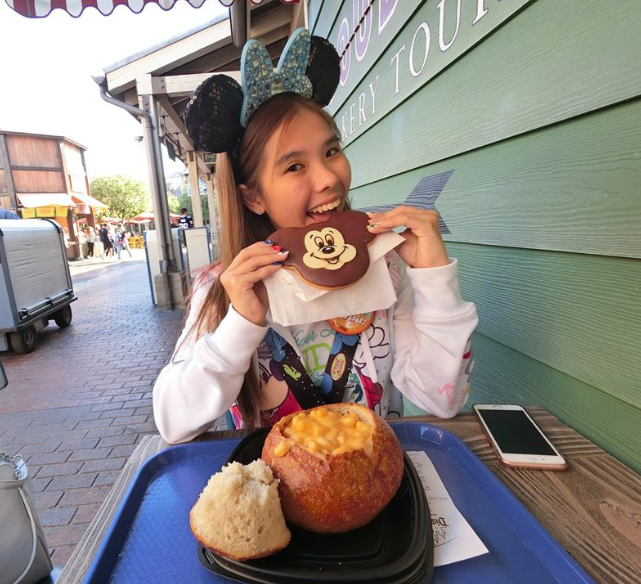 Special Thanks to my Fellow Tinks in the group who PM me and recommended me all the food of Disneyland, character dining and teach me all about Secret Menu! You Tinks ROCKS! I love you guys! ALWAYS!